Epogen, Aranesp, Kineret, Enbrel, Neulasta, Neupogen, Nplate, Vectibix, Prolia, Xgeva, and Sensipar/Mimpara. 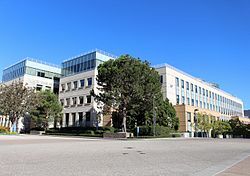 Amgen, which is one of the world's largest biotechnology companies, was established in Newbury Park, California in 1980, where its world headquarters are located. It had 5,125 employees in Thousand Oaks as of 2017, which made up 7.5% of the city's total employment. It is the largest employer in Ventura County. Amgen has attracted hundreds of scientists to the Newbury Park area. Focused on the cutting edge of molecular biology and biochemistry, its goal is to provide a healthcare business based on recombinant DNA technology. The word AMGen is a portmanteau of the company's original name, Applied Molecular Genetics, which became the official name of the company in 1983 (three years after incorporation and coincident with its initial public offering). The company's first chief executive officer, from 1980, was co-founder George B. Rathmann, followed by Gordon M. Binder in 1988, followed by Kevin W. Sharer in 2000. Robert A. Bradway became Amgen’s president and chief executive officer in May 2012 following Sharer's retirement. The company has made at least five major corporate acquisitions. 1980. William Bowes from Cetus Corporation recruits Winston Salser from UCLA to start Amgen with a scientific advisory board consisting of Normam Davidson, Leroy Hood, Arnold Berk, John Carbon, Robert Schimke, Arno Motulsky, Marvin H. Caruthers, and Dave Gibson. 1989. Amgen received approval for the first recombinant human erythropoetin product, Epogen, for the treatment of anemia associated with chronic kidney failure. Epogen (also marketed by Johnson and Johnson under the tradename Procrit) would later be approved for anemia due to cancer chemotherapy, anemia due to treatment with certain HIV drugs, and for the reduction of the need for transfusions associated with surgery. 1991. In February 1991, Amgen received FDA approval for Neupogen for the prevention of infections in patients whose immune systems are suppressed due to cancer chemotherapy. A 2002 meta-analysis found that Neupogen treatment reduced the risk of febrile neutropenia by 38%, reduced the risk of documented infection by 49%, and reduced the risk of infection-related mortality by 40%. 1998. In November 1998, Immunex, a future acquisition of Amgen, received approval for Enbrel (etanercept), the first rheumatoid arthritis drug targeting tumor necrosis factor alpha (TNF-alpha). A 2006 assessment by the National Institute of Clinical Excellence of the United Kingdom concluded that etanercept and related rheumatoid arthritis drugs later introduced by competitors "are effective treatments compared with placebo for RA patients who are not well controlled by conventional DMARDs, improving control of symptoms, improving physical function, and slowing radiographic changes in joints." A more recent study demonstrated that compared to traditional disease-modifying anti-rheumatic drugs, treatment with etanercept improved survival, reduced cardiovascular events and reduced the incidence of hematological cancers. 2010. On June 6, 2010 Amgen received FDA approval for Prolia, a protein drug for the treatment of post-menopausal osteoporosis. In clinical trials, Prolia reduced the rate of vertebral fractures by 61% and the risk of hip fractures by 40%. 2010 In November 2010 the FDA approved Xgeva for the prevention of complications of bone metastases in patients with solid tumors. The clinical trials primarily enrolled patients with breast or prostate cancer. 2012. Illegal marketing practices. The Los Angeles Times reported on December 18, 2012, that AMGEN pleaded guilty and agreed to pay $150 million in criminal penalty and $612 million to resolve 11 related whistleblower complaints. Federal prosecutors accused the company of pursuing profits while putting patients at risk. Larry Husten, a contributor at Forbes.com elaborates on AMGEN's illegal marketing practices in this case, namely that the "government accused Amgen of marketing Aranesp for indications not approved by the FDA and other illegal marketing practices". One of the drugs mentioned in the lawsuit had sales of $492 million in the third quarter of 2012, down 17% from the same quarter the previous year due to "reimbursement problems and label changes". 2013. Lawmakers inserted text into the fiscal cliff bill that will allow the drugmaker to sell a class of drugs that includes Sensipar without government controls for an additional two years. The New York Times estimated that the paragraph in the fiscal cliff bill will cost taxpayers an estimated $500 million but other assessments concluded that the change would protect seniors in rural areas and reduce overall Medicare spending. 2015. In September the company announced it would acquire Dezima Pharma for more than $1.55 billion. The same day the company announced a collaboration with Xencor on 6 early stage immuno-oncology and inflammation programmes. As part of the deal Amgen will pay $45 million upfront, with the deal being worth up to another $1.7 billion. 2016. In September, the company announced it would purchase the rights to Boehringer Ingelheims Phase I bispecific T-cell engager compound (BI 836909, now AMG 420) for use in the treatment of multiple myeloma. 2017. Cash returned to shareholders totaled a record $6.5 billion through dividends and share repurchases. 2000 – Kinetix Pharmaceuticals, Inc.
2007 – Alantos Pharmaceuticals Holdings, Inc.
2011 – BioVex Group, Inc.
2011 – Laboratório Químico Farmacêutico Bergamo Ltda. 2013 – Onyx Pharmaceuticals Inc.
As of December 2013, Amgen had 11 drugs in Phase III clinical trials. In November 2014 the company announced it was halting all trials of rilotumumab in advanced gastric cancer patients after one of the trials found more deaths in those who took the compound with chemotherapy, than those without. Later in the same week, the company (in conjunction with AstraZeneca) reported positive results for brodalumab in a phase III trial comparing the compound with ustekinumab and a placebo in treating psoriasis. In March 2015, the company announced it would license its Phase II candidate drug AMG 714 to developer Celimmune who plan to develop the anti-IL-15 monoclonal antibody for treatment against diet nonresponsive celiac disease and refractory celiac disease. In June 2015 Amgen presented Phase 2 clinical trial data for their anti-CGRP antibody AMG 334 for migraine, approved for sale as AIMOVIG in 2019. Amgen Inc. v. Harris, a United States Supreme Court case on employment law. ^ a b "Amgen 2016 SEC Filings 10-K". amgen.com. Retrieved 7 July 2017. ^ Bidwell, Carol A. (1989). The Conejo Valley: Old and New Frontiers. Windsor Publications. Page 128. ISBN 9780897812993. ^ a b Baker, Pam (2002). Thousand Oaks Westlake Village: A Contemporary Portrait. Community Communications, Inc. Page 37. ISBN 978-1581920611. ^ Bidwell, Carol A. (1989). The Conejo Valley: Old and New Frontiers. Windsor Publications. Pages 128–129. ISBN 9780897812993. ^ "Amgen, Form 10-K, Annual Report, Filing Date Mar 24, 1998". secdatabase.com. Retrieved Jan 8, 2013. ^ "Amgen, Form 10-K405, Filing Date Mar 7, 2000". secdatabase.com. Retrieved Jan 8, 2013. ^ "Amgen, Form 8-K, Current Report, Filing Date May 24, 2012". secdatabase.com. Retrieved Jan 8, 2013. ^ "Amgen—A biotechnology success story | From drug development to the mass market". ^ a b "Drugs@FDA: FDA Approved Drug Products". ^ Lyman GH, Kuderer NM, Djulbegovic B (April 2002). "Prophylactic granulocyte colony-stimulating factor in patients receiving dose-intensive cancer chemotherapy: a meta-analysis". Am. J. Med. 112 (5): 406–11. doi:10.1016/s0002-9343(02)01036-7. PMID 11904116. ^ Chen YF, Jobanputra P, Barton P, et al. (November 2006). "A systematic review of the effectiveness of adalimumab, etanercept and infliximab for the treatment of rheumatoid arthritis in adults and an economic evaluation of their cost-effectiveness". Health Technol Assess. 10 (42): iii–iv, xi–xiii, 1–229. doi:10.3310/hta10420. PMID 17049139. ^ Morgan CL, Emery P, Porter D, et al. (January 2014). "Treatment of rheumatoid arthritis with etanercept with reference to disease-modifying anti-rheumatic drugs: long-term safety and survival using prospective, observational data". Rheumatology (Oxford). 53 (1): 186–94. doi:10.1093/rheumatology/ket333. PMID 24140761. ^ "FDA approves Xgeva to help prevent cancer-related bone injury". ^ Terhune, Chad (18 December 2012). "Amgen pleads guilty to improper marketing of anemia drug Aranesp". Los Angeles Times. Retrieved 2 February 2013. ^ Husten, Larry. "Amgen Pleads Guilty To Misbranding Anemia Drug Aranesp". Forbes. Retrieved 2 February 2013. ^ "Article > Amgen's Aranesp fails in heart trial, Singapore plant planned". ^ Lipton, Eric (19 January 2013). "Fiscal Footnote: Big Senate Gift to Drug Maker". New York Times. Retrieved 2 February 2013. ^ "Jon Entine: New York Times Mum After Congressional Budget Office Rebukes Bungled Amgen/Medicare Investigation". Huffington Post. 26 February 2013. ^ "CBO analysis shows keeping oral drugs out of ESRD bundle could save money | Nephrology News & Issues". Archived from the original on 2013-06-05. ^ a b "For Up to $1.55B, Amgen Acquires Dezima Pharma". GEN.
^ "Amgen bets up to $1.7B on Xencor's antibody technology". FierceBiotech. ^ "Amgen, Xencor to Partner on Cancer Immunotherapy, Inflammation Drugs". GEN.
^ "Amgen Buys Rights to Myeloma BiTE Immunotherapy from Boehringer Ingelheim - GEN News Highlights - GEN". ^ "Amgen Reports Fourth Quarter And Full Year 2017 Financial Results". www.amgen.com. Retrieved 2018-05-14. ^ "Fortune 500 company by revenue 2018 cial". www.fortune.com. Retrieved 2019-03-18. ^ "Amgen, Form 8-K/A, Filing Date Feb 2, 1995". secdatabase.com. Retrieved Jan 8, 2013. ^ "Amgen, Form 425, Filing Date Oct 16, 2000". secdatabase.com. Retrieved Jan 8, 2013. ^ "Amgen, Form 8-K, Current Report, Filing Date Dec 17, 2001". secdatabase.com. Retrieved Jan 8, 2013. ^ "Amgen - Media - News Release". amgen.com. ^ "Amgen, Form 8-K, Current Report, Filing Date Mar 29, 2004" (PDF). secdatabase.com. Retrieved Jan 8, 2013. ^ "Amgen, Form 8-K, Current Report, Filing Date Dec 15, 2005" (PDF). secdatabase.com. Retrieved Jan 8, 2013. ^ "Amgen, Form 8-K, Current Report, Filing Date Apr 24, 2006" (PDF). secdatabase.com. Retrieved Jan 8, 2013. ^ "Amgen, Form 8-K, Current Report, Filing Date Sep 29, 2006". secdatabase.com. Retrieved Jan 8, 2013. ^ a b "Amgen, Form 10-Q, Quarterly Report, Filing Date Aug 9, 2007" (PDF). secdatabase.com. Retrieved Jan 8, 2013. ^ "Amgen, Form 8-K, Current Report, Filing Date Jan 25, 2011". secdatabase.com. Retrieved Jan 8, 2013. ^ "Amgen, Form 10-Q, Quarterly Report, Filing Date May 10, 2011" (PDF). secdatabase.com. Retrieved Jan 8, 2013. ^ "Amgen, Form 8-K, Current Report, Filing Date Jan 26, 2012" (PDF). secdatabase.com. Retrieved Jan 8, 2013. ^ "Amgen, Form 8-K, Current Report, Filing Date Apr 30, 2012" (PDF). secdatabase.com. Retrieved Jan 8, 2013. ^ "Türk ilaç devi 700 milyon dolara satýldý". hurriyet.com.tr. ^ "Amgen, Form 10-Q, Quarterly Report, Filing Date May 8, 2012" (PDF). secdatabase.com. Retrieved Jan 8, 2013. ^ Guha, Malini (October 8, 2013). "Amgen swallows Onyx whole". Nature Biotechnology. 31: 859–860. doi:10.1038/nbt1013-859. PMID 24104731. Retrieved November 6, 2013. ^ "Amgen acquires Catherex Spin-off from Medigene - GEN News Highlights - GEN". ^ "Stemgen® (ancestim)". sobi.com. Archived from the original on 2013-12-30. Retrieved 2013-12-30. ^ "GEN - News Highlights:Amgen Halts Rilotumumab Trials in Advanced Gastric Cancer". GEN.
^ "GEN - News Highlights:Brodalumab's No Turkey in Phase III: Amgen and AstraZeneca". GEN.
^ "GEN - News Highlights:Celimmune Licenses Amgen's AMG 714 for Celiac Disease". GEN.
Wikimedia Commons has media related to Amgen.